For those of you unfamiliar with Mike Hughes, or as he is affectionately referred to, Big Mike, he was a contestant of Top Shot Season Three where he was a second-place finalist on the History Channel. Mike is the founder and president of Next Level Training in Ferndale, Washington. He is also a United States Practical Shooting Association competitive pistol shooter and placed 7th at Nationals. He had invented his own training pistol called the SIRT Pistol. Mike played football in college. When not shooting, Mike can be found lifting weights, sprinting, hiking, or being with his family. On Wednesday, October 26th and Thursday, October 27th, however, you can find Mike right here on USA Firearm Training. On Wednesday, Mike will be joining us for episode 64 of the Concealed Carry Podcast, where he will sit down with USA Firearm Training president Jacob Paulsen and podcast host Riley Bowman and talk shop. 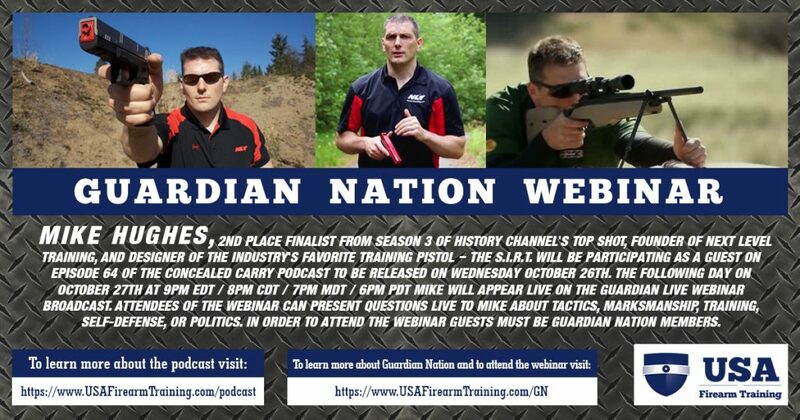 Then on Thursday, Mike will be joining us for our monthly members-only webinar for USA Firearm Training's brand new online training community, Guardian Nation. For more information, follow the link provided and find out about all of the great benefits and value that will come when joining Guardian Nation. We here are very pleased to have Mike come and join us and are very excited to get to know him better.